What if truth is not an absolute thing, rather a muscle that grows weaker with neglect? 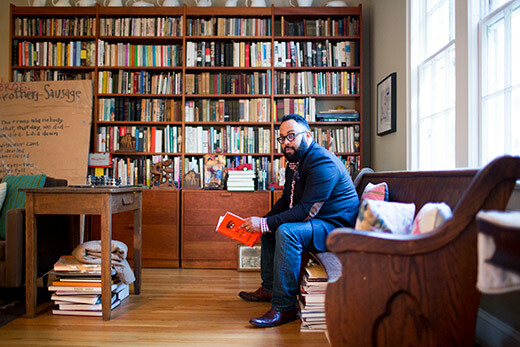 Poet and scholar Kevin Young poses that question in his timely new book, “Bunk: The Rise of Hoaxes, Humbug, Plagiarists, Phonies, Post-Facts, and Fake News” (Graywolf Press, 2017), a sprawling exploration into fakery, falsehoods and the hucksters who perpetrate them. As much an expansive history lesson as a cultural critique, Young’s latest work carefully tracks the phenomenon of the hoax in the United States, from P.T. Barnum’s circus sideshows to the current political arena. Yet despite recent dialogue surrounding so-called “fake news” and “alternative facts,” Young’s interest in the topic actually took root long ago. “I worked with someone who kind of hoaxed us when we were in college and working together,” recalls Young, Emory University Distinguished Professor, who now serves as director of the Schomburg Center for Research in Black Culture in Harlem and is the newly named poetry editor of the New Yorker magazine. “Like many people, I find that kind of deceit and con artistry fascinating," he says. "Just look at Hollywood, it seems like every other movie is about another con artist or ne’er do well." What began as “a slim meditation on a few hoaxers I’ve known” ended up as a deep, six-year dive into the world of deliberate deception and what drives it. “One of the things that helped me, and I think it is important to mention, is that I did so much research using Emory’s collections, both the special collections, where I was curator, and regular collections,” says Young, former curator of literary collections for the Rose Library and Charles Howard Candler Professor of English and Creative Writing, who taught at Emory from 2005 to 2016. "To write about hoaxes in full … is to track down the books that often contain them." And so he did, drawing from an expansive well of iconic hoaxes that includes Barnum’s sideshow figures, turn-of-the-century spiritualists, racial fraud, journalistic plagiarism, made-up memoirs and outright identity theft. “I set out to track down a lot of hoaxes in as original form as possible,” Young explains. Along the way, Young practiced what he preaches. His chapters are supported by a thick trove of documentation, including 69 pages of notes and a 26-page annotated bibliography. In a “post-fact” world — he dubs it “the Age of Euphemism” — the ability to prove your point with the support of primary evidence has become more critical than ever. Race: The most dangerous hoax of all? Con artists may draw upon gaining your confidence, but a hoax builds upon assumptions, suspicion and stereotypes, he found. In fact, “hoaxes often depended upon race to accomplish a lot of what they wanted to get done,” Young contends. Studying examples throughout history, Young was less surprised by the sheer quantity of hoaxes that have permeated the American landscape as he was “by how people would write entire books about hoaxes and not have a single footnote, which duplicates the problem,” he asserts. Why has the American public been, as Young puts it, so willing to deceive and believe? Does it mark a profound cultural shift? Or is it just who we are as humans — both gullible and deceptive? Today Young finds hoaxes are both “overexposed and underexplored,” coming at us faster and faster, he notes, as we move from a world of half-hoaxes to a full-time one. “Today’s hoaxes rely less on human nature or collective memory than cultural amnesia,” Young writes. Technology — from the faceless accessibility of the internet to impulsive tweets — makes it all the easier for us to lose our “radar for truth.” “The thing that becomes troubling when it comes to perpetuating a hoax is that retweeting something can be just as bad as creating it,” Young says. Released this month, “Bunk” has already garnered enthusiastic reviews and was recently longlisted for the National Book Award for Nonfiction. Young’s next book, due out in April, is a collection of poems titled “Brown,” which explores “different kinds of brown-ness, from James Brown to John Brown,” he says. As part of his publicity tour, Young will speak about “Bunk” at Emory’s Rose Library on Jan. 18.